GINNY was actually "born" in 1922, in Massachusetts, USA when a young woman, Jennie Graves, began sewing clothes for imported German dolls, and selling them to a Boston department store. Success followed success until 1948 when a dip in sales inspired Mrs. Graves to introduce an 8"/22.5cm plastic doll. By 1953, her company, Vogue Dolls Inc., were selling two million dollars worth of dolls and clothes annually. The original GINNY's success lived on until 1972 when the Vogue name was sold to the Tonka Corporation, and then to the Lesney Corporation in 1977. In the late 1970's and early 1980's, the Vogue Doll Co. was a subsidiary of The Lesney Corporation, and they gave GINNY a new look. 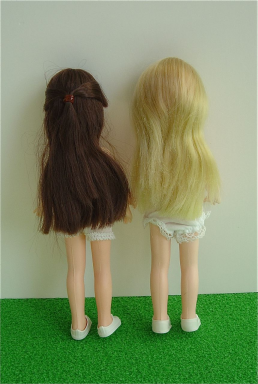 She became an older, more slender little girl with long blonde or brunette rooted hair - that is thick and ideal for little girls who like to do a lot of hair styling - closing eyes, and bendable knees. At 7.5 in/19 cm tall, she is sometimes known as the "Skinny Ginny". 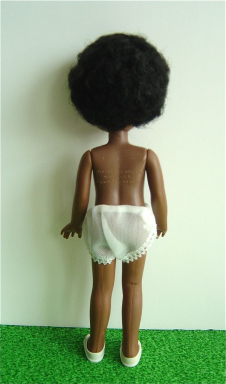 They also created a short-haired, African- American Ginny doll who came on the scene in 1977. Both are reasonably priced today and lovely to play with; both have really sweet expressions.